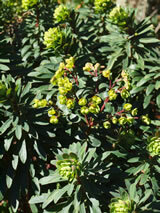 A clumping perennial with a woody base and very appealing deep blue-green foliage on green tinged purple stems. Very showy big clusters of lime gold flowers in spring. The range of colours of flowers and foliage is considered to be similar to those of the kea, that cheeky high country parrot, hence the inspiration for the name. 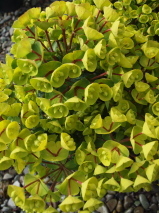 They prefer growing in well drained soil in an open position, not crowded by other plants. Wonderful for providing texture and interest to the garden. Hardy.